Note that I refrained from calling this “Top 12 qualities of a social media expert”. It might be too broad. Do you have to be young and a digital native like Anne Reuss, Networlding Social Media Team member, having been raised with computers? Or does it come with age and experience, having taken part in social media since Classmates started (it was founded in 1995!). What separates the true innovators from all the clamor and noise from the masses in social media? 1) Adaptable. If you can’t adapt or accept where customers are going because you personally don’t like the website, then you’re going to have tough luck bringing in your customers or friends. You have to market and engage where it’s relevant, even if you’re not the #1 fan. 2) Write. Social Media can be moody. Google keeps fumbling at their attempt to match Facebook, Facebook modifies their layout while people moan or men claim “Pinterest‘s for girls!” but what has stood true and strong throughout all of this? Original content. Blogs! 3. Confidence. Believe in yourself, brand and/or product. Having a lot of buddies or followers doesn’t translate in sales. Incorporate call to actions in your messages and don’t be shy. 4. Open-minded and curious. You may get followed on Twitter or Pinterest by strangers, but don’t fret. It’s flattering. You’ve drawn people in. The best compliment you can give someone is to ask questions. No auto direct messages, I beg you! How impersonal. 5. Independent. Social Media personalities have their own style. They may ask for advice, and adhere to certain common sense courtesy, but they don’t turn in copycats. Who wants to be a plain-jane, anyway? 6. Be conscious of what other people are sharing and saying. Drive value to others by acknowledging others, read their profiles and blogs, and ask questions. By paying attention to others, you will naturally attract attention to you (and your brand). 7. Proactive. Don’t wait for the people to come flocking to you. You often will have to make the first move. Ask questions, comment and have the ability to push out original content. If you’re only retweeting, rewording other ideas or making comments of no value, then you aren’t as proactive as you might think. 8. Be effective. I say this because new tools continue to come out, such as BundlePost (the latest and most amazing content management system for multiple clients) but you won’t be effective if you spread yourself too thin by trying to be on every tool out there. Tailor your strategy to meet your goals. You may have to tweak your strategy as new tools come out, so write out a plan for 2 to 3 months max. 10. Creativity. With millions of users on Facebook, Pinterest, Twitter and other platforms, it starts looking blurry….What and who stands out to you? Those people are creative in ways they leverage and curate content. 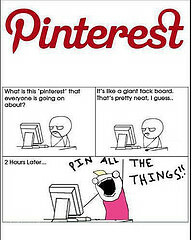 For an example on unique curation, see Pinterest: Another Angle on Content Curation. 11. Be a Team Player. Recognize that incredibly effective social media sometimes requires good SEO, too. You might not have time for that, so find a partner or hire somebody that can focus on that for you. 12. Kindness. Simple. People and customers don’t want to have an unpleasant encounter with a bored, cranky or cocky online personality. Be kind and be rewarded. I know there are certainly some I’ve missed, so please comment if you think I’ve missed a critical point that calls for a comment! Special thanks to Anne Reuss for helping with this list! previous post: Networlding Works, Communications Expert Says.